A New England classic, these glorious, savory bread-pillows remind me of the home I like to let other people imagine I had. It’s a farmhouse, I think, somewhere in an historic Massachusetts town, with sunlight streaming in the leaded windows. It’s got a sweet golden retriever, hardwood floors, and a family that makes popovers together on Sunday mornings while listening to jazz classics and NPR. In my real home, there was a golden retriever. But. She was deranged. Every time the doorbell rang, she would sprint across the kitchen, skid over the hardwood floors, smash into the door, and spend about forty minutes losing her mind. We had to lock her in the bathroom every time someone came over just to contain the chaos. On hundreds of occasions, we found her face buried in the litterbox, gnawing on mummified cat poop, or running circles around our living room with someone's socks lodged between her jaws. To be honest, I don’t remember if we had popovers at home even one single time, but I like to imagine we did, because wouldn’t that be perfect, just like our perfect dog? Ever since I moved to Seattle, I’ve been perfecting my popover recipe, envisioning my sunny homestead back in Massachusetts. I plan to make them with my children someday, with our beloved golden retriever feasting on poop mummies in the next room. Because if that’s not perfect, welp, I don’t know what is. NOTE: This recipe is listed by weight as well as volume. If you have a scale, use the weights. If you don’t have a scale, consider buying one—baking by weight is cleaner and more accurate. A badass New England classic that’s fun to fuss over, but delicious even when you screw it up. The key is this: Technique. No matter what happens, you’re going to end up with some delicious little popover-like item, but if you want big, pillowy, holy-crap-you-made-those?! popovers, you’ll need to focus on technique. One thing you can do to increase your chance of success: Keep that oven door closed. The whole time. Do not peek. This keeps the heat trapped, so the popovers can fully inflate. Serves: Six popovers, which is usually a good breakfast for 2–4 people, or a side dish with a hearty dinner. Drink: Sparkling wine—it's brunch after all! Place the empty popover pan in the oven and let it get wicked hot as you prep the batter. If you have a microwave, use that. Otherwise, sloowwwwly melt it in a little pot over low heat. As soon as it’s done melting, remove it from the heat and let it cool. If you’re in a hurry, place the whole pot in the freezer or the fridge to cool. NOTE: You want this butter to be completely cool when you add it to the batter in Step 4, otherwise it’ll cook the eggs. (You’ll know you cooked the eggs if the batter turns chunky when you pour in the butter.) If that happens, all is not lost. You can just strain out the cooked eggs after Step 4 with a fine-mesh strainer. Don’t have a fine-mesh strainer? Might want to start over. NOTE: If you have a bowl with a handle and a spout, use it! Otherwise, any medium mixing bowl will do. Add melted butter, milk, flour, and salt to the eggs, and whisk gently until smooth and well-combined. If your batter is chunky or lumpy, strain it with a fine-mesh strainer. Transfer batter to a large pitcher if you have one. Pour batter into each cup, filling almost to the top. Do not open the oven door. 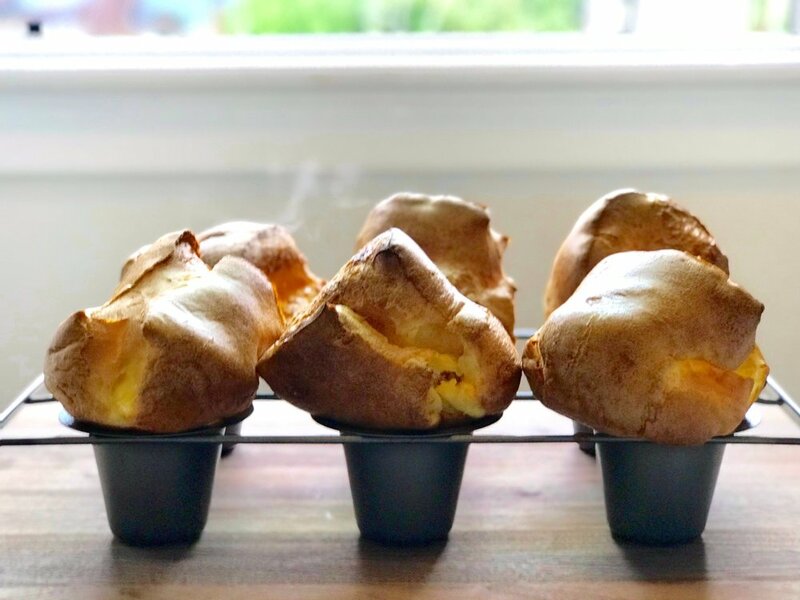 Take the popovers out and poke a few holes in the tops of each with a toothpick, to release steam. 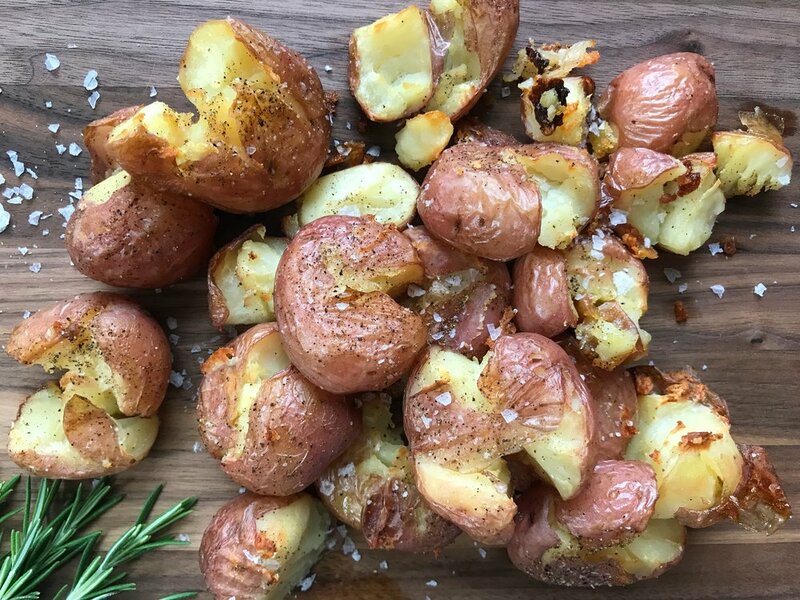 Return them to the oven and cook for 5–10 more minutes. This sets them. Remove from the pan, and eat while they’re rippin’ hot! Do I need a special popover pan to do this? Kinda, yeah. I’ve read that people make popovers in muffin pans, but it’s never worked for me. You need the extra volume of the special popover cups in order to generate enough steam to get those dramatic, poofy tops. I have this one, which is $20, and I use it all the time. What the heck should I serve these with? At my house, we eat them for breakfast with good honey, good butter, and flaky salt, or with fried eggs and bacon. You can also make them into little breakfast sandwiches, like they do at Pie in the Sky, on Cape Cod. Traditionally, popovers are served as a kind of roll with hearty winter dinners. What kind of milk should I use? Any kind works. Do I really need to strain it? I have always gotten the biggest, most dramatic tops when I strain the batter so it’s silky-smooth. If you don’t have a strainer or can’t be bothered, hey, that’s fine, too. Your popovers may end up a little denser. Anything I can do in advance? You can make the batter in advance and refrigerate it. Just make sure you let it come up to room temperature (see above) before you pour it into the cups. I like sweeter popovers and these have no sugar. Can I add sugar? Definitely. This formula pops really well (plus I like the savory flavor), but if you want sweet ones, use four eggs instead of six, and then add 100g of granulated sugar.